International Organization of Wine and Vine (OIV) statistics on the top wine producing countries of 2017 didn't show any major changes in hierarchy from 2016, though New Zealand dropped two spots to 16th in the world. 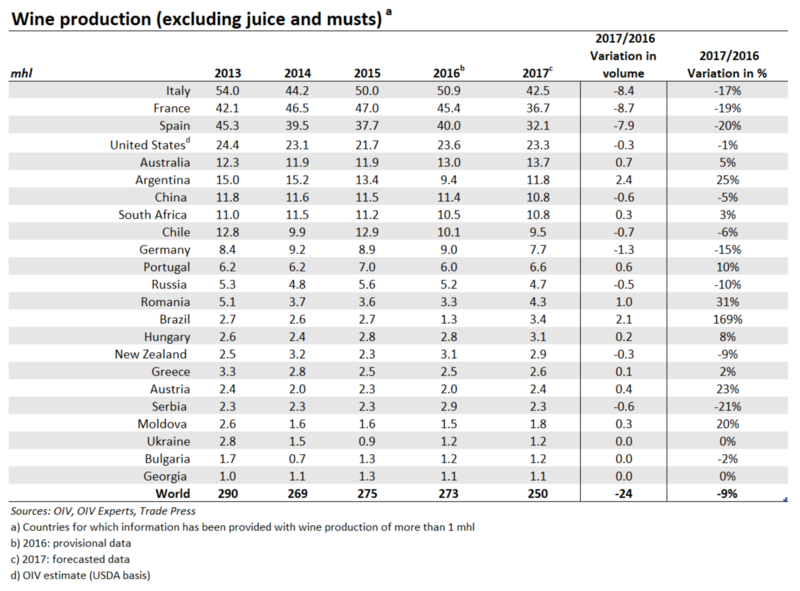 Italian wine production was the world's highest for the third year in a row. However, total global production decreased by 9% to 25 billion liters. That's the lowest it's been since 1957. Europe's top three wine-producing countries—Italy, France and Spain—suffered substantial year-over-year declines. The drop is largely due to weather. Devastating frosts damaged vines and lowered potential yields early in the year. Summer saw heatwaves, thus severe sunburn and raisining further decreased usable tonnage. Production levels in the United States are very consistent from year to year. California accounts for nearly 90% of U.S. wine production. Most California wine-growing areas have Mediterranean climates. That makes widespread, vine-damaging weather extremely rare. Argentina was the world’s fifth largest producer for several years. However, in the past three years, its vineyards have been badly hurt by issues related to global warming. Growers believe current levels are the new normal. In both Argentine and Chile, intense El Niño seasons have been leading to more frost, ill-timed rain, and rot and strong La Niña seasons brought intense heat and early harvests. Decreasing snowpack in the Andes is beginning to cause concern about availability of water for irrigation too. Mendoza is, by far, the largest Argentinian growing region. But that area is virtually a desert and is extremely dependent on irrigation. Australia’s potential for production growth is limited by climate, availability of water for irrigation, and by high labor costs. Production there is often adjusted due to pressure from currency exchange rates too. Roughly 60% of Australian wine production is for export and, when rates are unfavorable, the country can find itself swimming in excess wine. Fortunately for them, their exports are soaring right now. The country with the best chance to make a big move up the list is China. It has a lot of available land which is well-suited for wine grapes. Labor is very inexpensive there too. If China can either increase its quality enough to enable high-volume export sales, or convince more of its own populace to drink wine, the huge potential for growth could be realized. Vineyard acreage in most European countries showed little growth or declined somewhat from 2016 to 2017. Acreage in Italy increased by about 12,500 acres. France showed the second largest increase with a boost of just 2,250 acres.Acreage in Spain, the European country with the greatest vineyard acreage, dropped a dramatic 20,000 acres. Spain has regularly decreased its plantings over the past several decades in an effort to improve overall quality. Outside of Europe, the biggest increase in plantings was in China, with a gain of about 15,000 acres. The next largest was New Zealand with an uptick of only 2,000 acres. United States acreage increased by a negligible 750. Vineyard photo courtesy of Altesino.